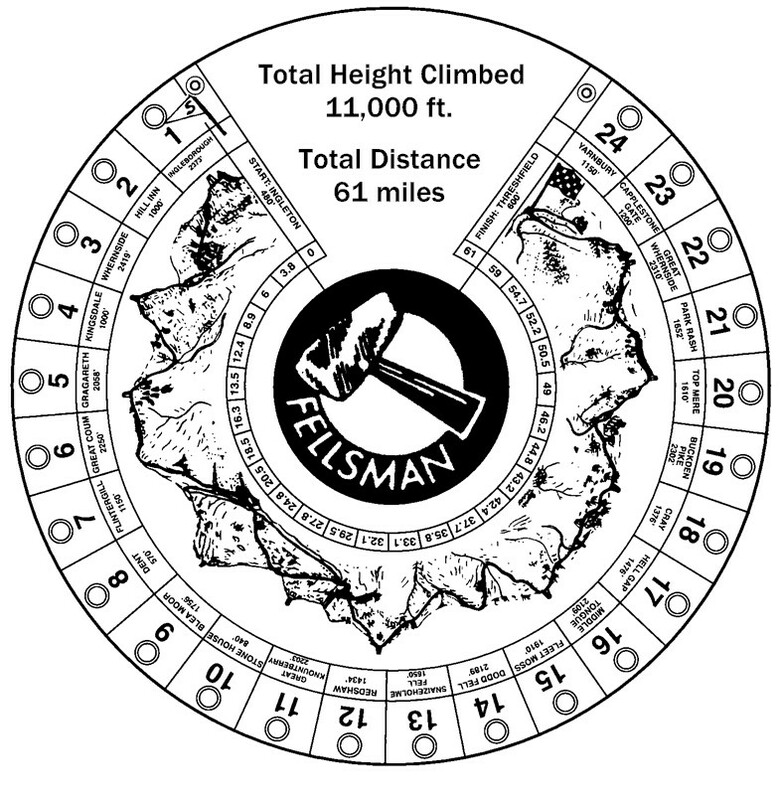 Organised by Keighley Scouts, The Fellsman Hike was first put on in 1962 as a long distance walk – 61 miles and 11,000 feet of ascent in a horseshoe between Ingleton and Threshfield, taking in many of the highest peaks in the Yorkshire Dales. With the increasing popularity of ultra running events (generally considered to be a run of longer than marathon distance), it has become a permanent fixture on the long distance calendar, sponsored by The North Face and is a qualifying race for the Ultra Trail du Mont Blanc – my ultimate target in 2014. As a slightly (!) overweight former fell runner in my 30s, I can only conclude that it is the onset of some sort of mid-life crisis that compelled me to enter an event that, in most years, 40% of those who enter do not complete. I’ve run a few mountain marathons and an Ironman triathlon in the past, but the most recent of those is 2 years and 2 stone behind me. Yet somehow I found myself on the start line in Ingleton, looking up at all 2000 feet of the first climb up Ingleborough. Light blue on your fitness test does not prepare you for this. I spend a few minutes catching up with a group of old friends, some of whom are challenging for a medal position; “Bloody hell Ben…you’ve got fat!”. I know this is the last time in the race that I will see them. My 2 goals are: 1) to finish, and 2) to do so in less than 24 hours. I have a rough plan in my head to walk the uphills and run the downs and flats for as long as possible, and keep eating and drinking every 20 minutes, in the hope that constant sugar will be a good substitute for the fitness I’m lacking. I’m carrying a lot of food in addition to the required safety kit; I’ve learned in the past that trying to survive off gels and sweets is fine for a couple of hours, but before long I won’t be able to handle anything sugary. As such, I’ve developed a highly scientific combination of bags of dolly mixture, jelly babies and cashew nuts interspersed with pork pies and pepperamis. Though it sounds (and is) bizarre, pepperamis will repeat on you for at least an hour after eating, so are great to take away the taste of dehydration and sugar! The first half of the run is surprisingly pain-free. I summit a cold and snowy Ingleborough, with a trail of faster entrants snaking ahead of me, descending carefully on treacherous ice. I pass the checkpoint (CP) at the Hill Inn, filling my bottle before heading up Whernside. I pick up a piece of flapjack from the CP staff in Kingsdale, not noticing at first that they are all in fancy dress. This strikes me as slightly odd, but I’m already heading up the (at times vertical) side of Gragareth so don’t have time to think about it. The summit marks the length of my longest training run, before an achilles niggle put a complete stop to my preparation; getting here is already an achievement. However I have my eyes set firmly on the finish, 50 miles ahead of me, so I set off across the boggy moorland with, as I find out, Helen (an IT specialist for the local Police) and Tom (a truck driver) for company. It is over the next few hours that I discover what ultra-running is all about. For most, they aren’t competing against other people; they’re competing against themselves. As a result, everyone I meet is unfailingly friendly and chatty, sharing a special bond forged by the fact that we have chosen to go out in to what remains of the wilds of the UK and test ourselves. It doesn’t mean hanging about for someone who can’t keep up though, and Helen and Tom soon disappear over the skyline. The cloud of the morning turns in to bright sunshine in the afternoon, then in to snow as the sky darkens. For safety, competitors are grouped once it gets dark. I’m not sure my group are that chuffed to be lumbered with me as I slow from a jog to a shuffle, but as long as I keep going, they’re stuck with me until it gets light. For me though, this is a blessing, as 3 of the guys I’m grouped with have done the event before and know the route so I don’t have to worry too much about nav. The leg from Fleet Moss to the aptly named Hell Gap is notoriously challenging to navigate even in daylight. With virtually no moon, no clear landmarks and the wind constantly pushing us off course, it becomes a waking nightmare. The grassy tussocks turn in to 8 foot deep muddy trenches and it’s only because Nick, a thoroughly nice chap who comes up every 2 years from Kent (it clashes with his daughter’s birthday so he can’t do it every year) distracts me by chatting away and making the rest of the lads ease off the pace, that I keep moving. As we reach Cray, I put on another layer under my waterproof smock and force some tepid tomato soup down to try and warm up. As we set off up Buckden Pike, a hill I know well from my fell running days, I’m feeling like crap. Things are much improved however when I bring the soup back up. The feeble light from my headtorch barely illuminates the small tent next to the cairn that is our next CP. I get my tally punched then head down off the top. With my mind elsewhere, I don’t notice the sheen of ice on the next stile; the wind catches me and whisks me off it backwards. Fortunately my fall is broken by a large muddy puddle. Nick hoists me up and as we descend, we pass the memorial to the Polish airmen who died here when their Wellington Bomber crashed in to the hillside in a blizzard in January 1942. In these conditions, it’s easy to see how it could happen. By the time we reach the foot of Great Whernside, we’ve been on the move for 21 hours and there’s a flock of birds flying round my head. It’s when I start shooting them down with a bow and arrow that I realize they’re a product of my very tired brain hallucinating. We have about 10 miles left to “run” to the finish line; it’s by no means certain at this point that I’ll make it. Luckily, as day breaks and we are ‘de-grouped’, Nick tells me he’ll stay with me. In my exhausted state, this nearly brings me to tears; this is the closest to retiring that I have come, as I know I’m holding him back. It’s made worse by the recovery bus driver shouting out “Is anyone stopping here? I’m heading back to the finish now!” But I can’t get so close and give up. I dig deep, shove some jelly babies in my mouth and some Vaseline on my severely chafed undercarriage and we set off up the last big hill of the race. Looking back a month later, this is still the most challenging event I’ve done, made bearable by the amazing competitors and checkpoint staff. But I’m already experiencing that sensation, familiar to all athletes, of painful memories diminishing and cheerful memories becoming better and brighter. I’ve just sent my entry in for the next Mont Blanc qualifier, the 44 mile Classic Quarter in Cornwall. Oops. The event website is at www.fellsman.org.uk, and you can read the astonishing story of the survivor of the Wellington crash at www.buckdenpike.co.uk.